I love me some Steve Martin. 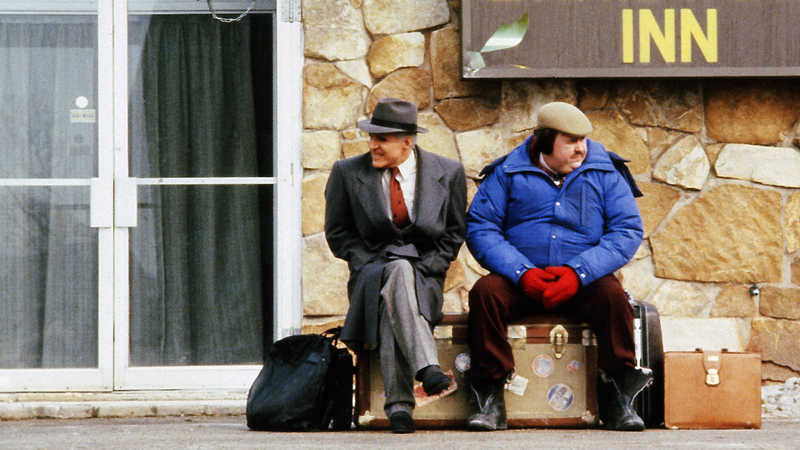 Watching him as the de facto host of SNL 40 reminded me that I was sitting on PLANES, TRAINS & AUTOMOBILES, one of his few landmark films I had yet to see. Looking for some laughs on yet another snowy Maine night, I went ahead and threw it on. I watched PLANES, TRAINS & AUTOMOBILES (1987) on 2.24.15. It was my first viewing of the film. Let’s start this with a confession. I didn’t love this movie. Maybe that is blasphemy to John Hughes fanatics or 80s comedy geeks (both of which I usually count myself among), but PLANES, TRAINS & AUTOMOBILES isn’t the apex for me. That isn’t to say it is a bad movie. John Candy is funny as curtain-ring salesman Del Griffith. Steve Martin has some really top-level bits as marketing guy Neal Page. Their chemistry isn’t bad, though Martin and Candy have both had better partners for their respective talents. There isn’t a scene to point to as embarrassing, there are just too few to list as hilariously memorable. When taken as a whole and looked at as a 90 minute story, this is not a film which is totally satisfying. The plot, which concerns Neal trying to get home to his sweet family for Thanksgiving, has he and his nemesis/traveling partner Del utilizing all of the modes of transportation that the title implies. They hit one roadblock after another. From taxi, to plane, to train, to bus, to car and so on. One issue, it would seem, is that Martin’s Neal is a little bit too much of a jerk too quickly. Martin does his best to temper this with appropriate restraint in the moments after his explosions, but the script doesn’t do a particularly great job of justifying why he is such a jerk and then why he chooses to become such a nice guy. Really, for a guy who seems relatively well adjusted and successful, he does and says some horrible things to make to give this comedy its more extreme moments. These moments just don’t add up to a comprehensive whole. Further, they make Martin’s Page a guy who is neither the sort of man who needs to become better like Martin’s THE JERK or the lovable guy to whom bad stuff keeps happening as in FATHER OF THE BRIDE. Instead, he is in this sort of comedic middle ground where the final resolution feels like a convenient end to the film rather than a true come-to-Jesus moment (and by Jesus I mean John Candy). It almost pains me to say that I didn’t really have a great time with this movie. I love Candy, love Hughes, and consider Martin one of the great comedic talents of the last forty years. PLANES, TRAINS & AUTOMOBILES just didn’t do it for me, though I would love to hear why you think I am dumb for saying so! ~ by johnlink00 on February 25, 2015. A lovely piece that shows the wonderful chemistry between Candy and Martin. Shame they didn’t get to try more of it out. Good review John. I’m not going to say you’re dumb for not liking it, but this is one of my all-time favourite comedies. Nice assessment all the same. I think I need to see it again. I’m really confused why it didn’t grab me, particularly since this is the sort of comedy which is usually right up my alley! This is one of my all time favourite comedies 🙂 I do think nostalgia has something to do with it though. If you watch these movies the first time round and love them, they’ll always be great to you….but watching an old 80s comedy for the first time in 2015, I can’t see it ever making such as much impact? What about very young Kevin Bacon as well racing for the cab!! I did love seeing Bacon, I thought he would come back! I did just see Dirty Rotten Scoundrels for the first time and I really loved it. But this one, I just wish I liked it more! Another great movie!! I like that a lot 🙂 Steve Martin and Michael Caine worked so well together!!! Tremors! Man, I forgot all about that movie. See, I had more fun with Tremors than I did with Planes, Trains & Automobiles! I don’t really like comedies very much but I do like this! That seems to be the consensus. Everyone but me. I’m a miserable old fart. Shame you didn’t like it more – this is has been a go to comedy for years for me. Always laugh hard when I watch it. Haha, I’m starting to think there is something wrong with me. I need to watch it again. I’ve had this one in my life since I was a child. Had a lot of time to grow with it. It has become a source of quoting among my family. That was Ghostbusters, Princess Bride, and Roger Rabbit in my house. Christmas Vacation is another biggie for us and the Fletch movies along with the Vacation ones.